Home Nonsense Funny Articles Where Do Peanuts Grow? Do you remember the last time you tucked into a thick, sweet peanut butter and jelly sandwich? The contrast of salt and sweet hits just the right taste buds to make it a favorite comfort food. Choose the chunky peanut butter and add crunch to the mix. All followed by a nice cold glass of milk. But where exactly did the peanut come from and what sets it apart from other nuts? 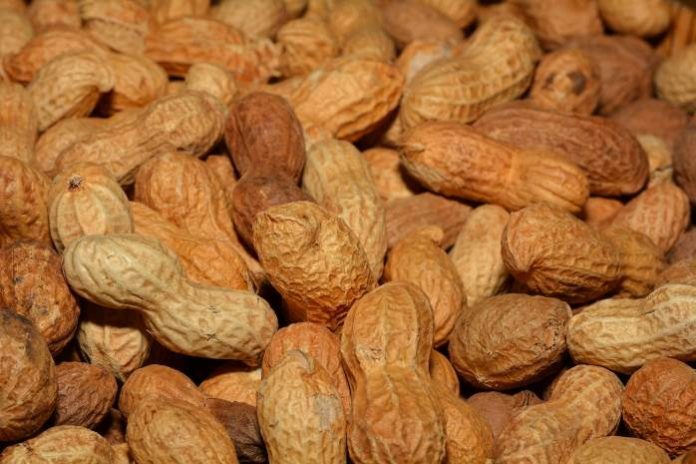 Peanuts, which are technically goobers (yes, that is a real word), are members of the legume family that grow underground in warm climates. In the United States, most come from the southeastern states, particularly Georgia and Virginia. New Mexico, Texas and Oklahoma also produce crops of Spanish peanuts, which are smaller and a bit harder than their plump Virginia cousins. First cultivated in China, different varieties of peanuts are also grown in places such as Spain, Latin America, and parts of equatorial Africa and Asia. Typically, peanuts are used in crop rotation to help re-energize the soil. They are often planted as filler crops because they have special bacteria in the roots that help improve the nitrogen content in the soil. In the United States, in what’s known as the “Peanut Belt,” peanuts are planted after the last frost, usually around April. Peanut kernels saved from the prior year’s crop are set in rows, roughly 1-2 inches apart, and in individual holes about 2 inches deep. No crowding please! Peanuts need far less water to grow than other nuts. For example, it takes about 80 ounces of water to produce 1 ounce of almonds, but only 5 gallons for that ounce of peanuts. In about 10 days, the seedlings begin to peek out of the soil and eventually grow into plants roughly 18 inches tall. Self-pollinating yellow flowers appear at about the 40-day mark. Sorry, Mr. Bee, your services are not needed. Unlike most plants, which produce their seeds at the base of the fertilized flowers, the peanut seeds, or pegs, form underground. The plant continues to flower until there are some 40 pegs growing beneath the surface. It takes between four and five months to produce peanuts ready for harvest. Harvesting is done with special “digger” machines that are driven down the rows of peanuts. The diggers pull up the plants, shakes off excess dirt and then sets them back down, with the peanuts facing up. The peanuts are left to sunbathe for three or four days to reduce their water content down to 10 percent so they can be stored. A combine then shakes the peanuts from the vines, keeping the peanuts and putting the vines back onto the field. The vines nourish the soil as they decompose. In some cases, the vines are also used for livestock feed. The peanuts are placed in special wagons that have a warm air circulation system, sort of like a peanut sauna, so they may complete the drying, or curing, cycle. Previous articleWhat’s The Best Smell In The World? Next articleWhat’s The Best Thing To Add To A PB&J Sandwich?